When I began working with the new Party Animal Suite, I knew I had to make a bunch of party goodies that all coordinated. Monday, I shared my “Party” sign. You can read about it here. Today, I’m sharing my matching Treat Bag. 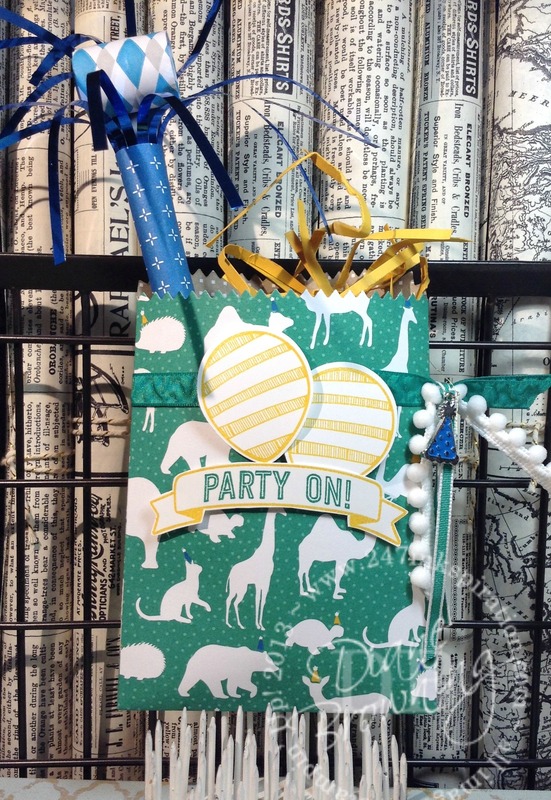 This treat bag uses my absolute favorite paper from the Party Animal paper pack. Just looking at those animals makes me smile. There is nothing better than bears and camels wearing party hats. It’s like everyone showed up ready to party. I covered the horn with the matching paper. And added some paper strips to help fill in the bag. Do you see that adorable party hat charm? That’s from this new Suite as well. The package contains both party hats and balloons. And every party needs cake! My cake includes that layering banner that I mentioned on Monday. 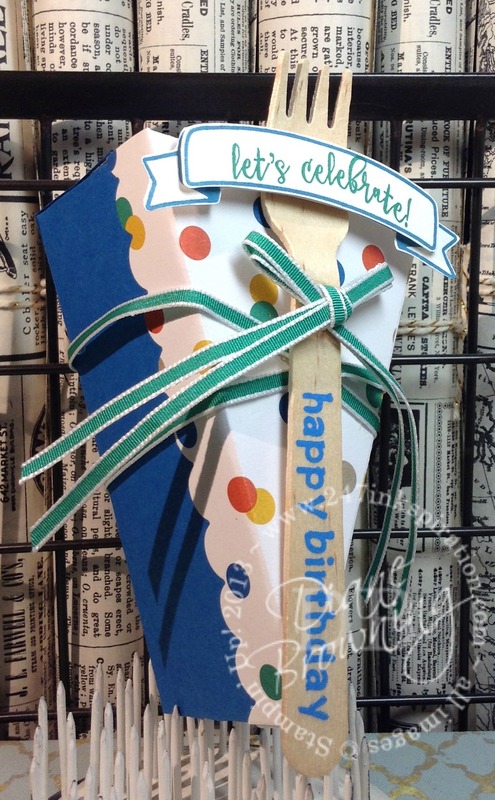 I found the fork at a local craft store and it was already pre-printed with the happy birthday. It was the perfect blue color to coordinate with the Party Animal paper. Here is a side view of the cake. 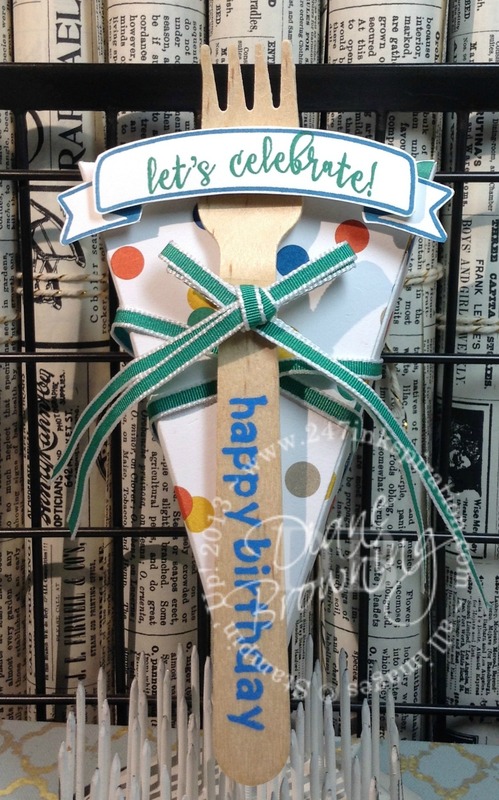 The bottom half is Pacific Point card stock and the top layer is the Party Animal paper. The cake is made from the Cutie Pie Thinlets and they are designed to be a treat box that can be filled with little goodies. The Emerald Envy Taffetta Ribbon holds the box closed. I’ll share more of my Display Projects from OnStage coming over the next couple of weeks. If you’re wondering how you can get your hands on the Party Animal Suite before it’s available on January 4th, then you need to contact me. 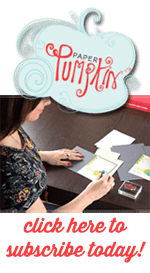 Stampin Up Demonstrators always have access to purchase products before they are released to the public. It is one of the many perks of being a Demonstrator. There is no obligation to hold classes or parties. You really can sign up “just for the discount”. Don’t forget November’s Special! I finally had a chance to play with my Stitched Dies. And I’ll be sharing those samples very soon. Thank you, Lynda! You are so sweet.